Hello everyone! 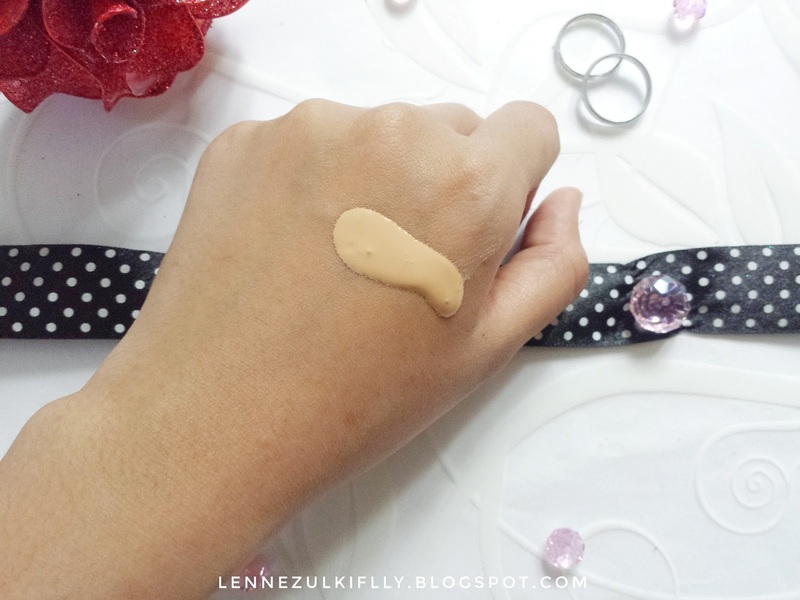 It's been a while since I last reviewed about foundation. 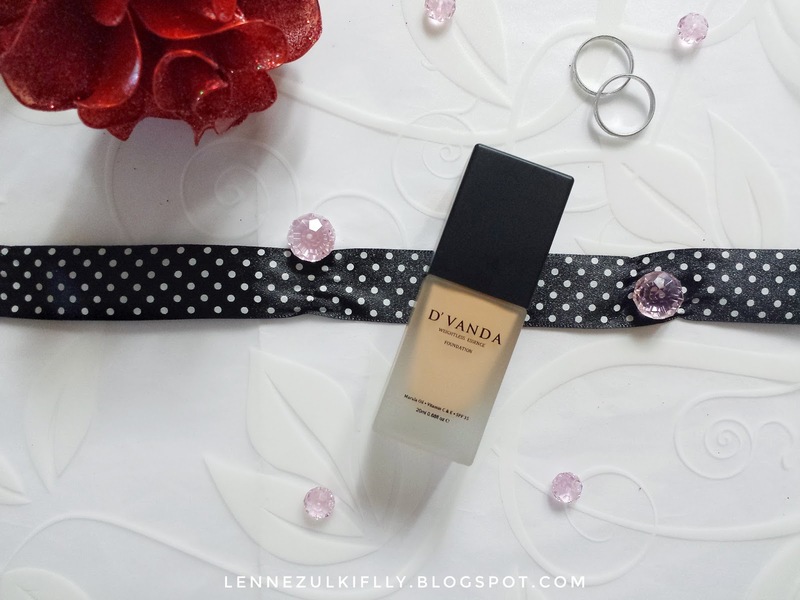 So, today I will be reviewing the foundation that I got from NSQ Cosmetics (Malaysian brand) which is D'Vanda Weighless Essence Foundation. I haven't heard of this brand specifically, not until the founder itself reached out to me, introduced me and briefed me about the whole shebang. Honestly, I was so skeptical but that lead me to do some research and "homework" by myself. I have tried this foundation for quite a few weeks now, and if you're following me on Instagram, you had probably seen my mini first impression on this foundation but that's about that. 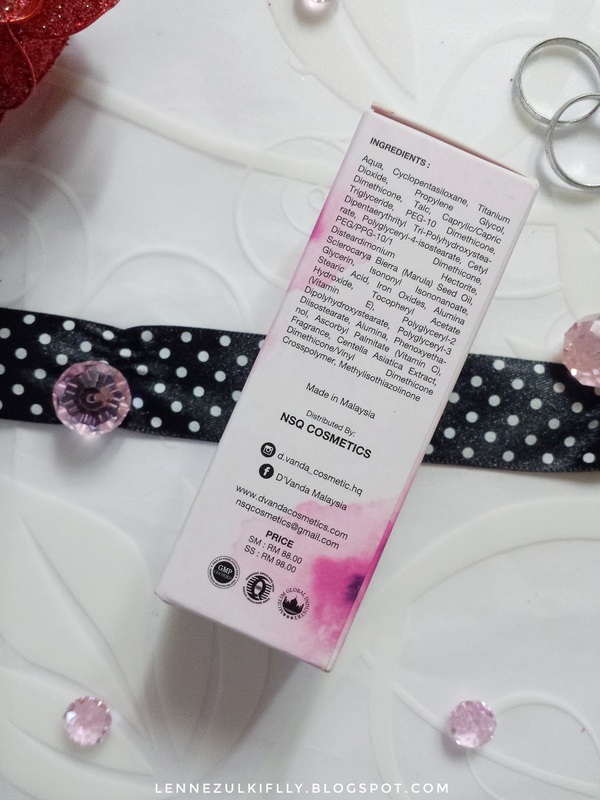 Decreases and treats pigmentation slowly from within. Improves acne problems, acne scars, dull complexion and uneven skin tone. Decreases the appearance of wrinkles and brings back the "youth" of the skin. 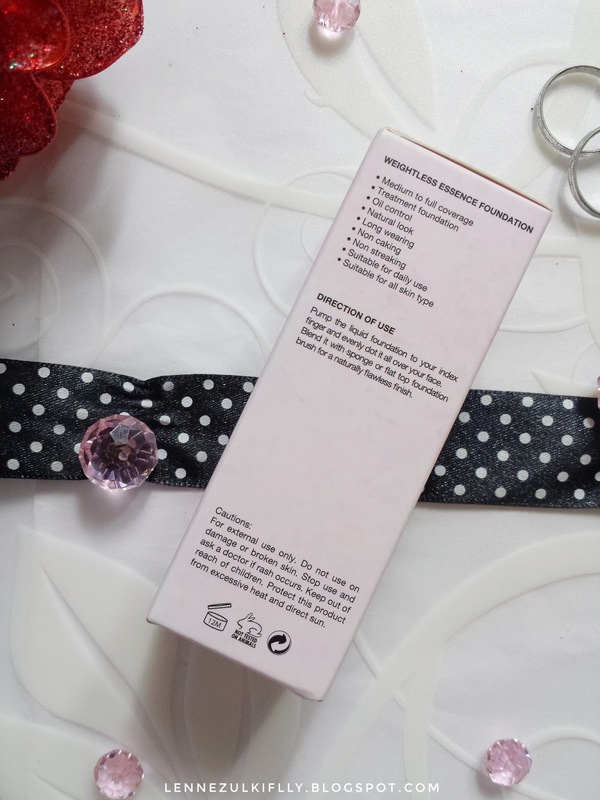 3 in 1 foundation: make up, treats and protects. Lightweight and easy to apply. Great for everyday use and natural look. Medium to full coverage. Wudhu' friendly and easy to remove. Non cakey foundation. Can we talk about the box for a second? It's so pretty, am I right or am I right? I'm a sucker for pretty boxes and you best bet that I keep pretty boxes like this. I have tons of them. Anyway, let's talk about the actual product now. I. Freaking. Love. It. It's so pretty! It's a frosted glass bottle and yes, it has a pump. Thank god! It's always a plus in my eyes. I really appreciate brands that really invest in a great packaging and practical for the customers. I have nothing much to say about the packaging. I really like it. When I first got this foundation, I was a little scared because I can tell from the bottle that it's too light for my skin tone. It's TOO light, you guys, but I tried it anyway. Surprisingly, the shade almost match with my skin! I'm so surprised because I have a medium tanned skin with a neutral undertone but this foundation doesn't looked "greyish" on me and most importantly, it doesn't oxidize. Thank god! However, you can tell that I'm wearing a foundation though it claims to be for everyday use and natural looking, it almost doesn't look natural. Maybe it's just my skin. The formula is definitely not matte. My face was really "glowy" and dewy after applying it. It has a dewy and satin finish, I would say. I'm loving the dewy, satin finish lately. I'm so used to matte formulas that I want to try something else. Anyway, the consistency is very liquidy and runny when I did 2 pumps of product on the back of my hand, which means, it's lightweight. It's so easy to blend which is good because you never know when you're running late and you're using a hard to blend type of foundation and you get frustrated, you got like uneven application and streaks everywhere. That's not cute. So, I like the fact that it's easy to blend. However, it creases on me so bad (even after a few minutes of application) and it clings on to my dry patches. Just bear in mind that this is the type of foundation that you need to set with powder and if you have dry skin, just make sure that you moisturize beforehand. As far as coverage goes, I would say it has a medium coverage. I tried to build it up to get to the fuller coverage like it claims to be but it almost looked cakey, patchy and uneven. And yes, I removed the foundation and had to re-apply it because I wasn't happy with how it turned out. So, medium coverage it is. I honestly think it's great for everyday use because it's not heavy and thick. The longevity is not half bad. I wore it for 6+ hours and nothing major worn off situation happened though I touched my face a lot. That's pretty impressive in my opinion because it was quite a long period of time. You know I had this thought in my mind saying it won't survive because local products I have used before had poor wear time but thankfully not this one. Another thing I like about it is, I didn't turn into a greasy mess at the end of the day though one of it's main ingredients is marula oil. I'm so pleasantly surprised! I can see myself wearing this foundation again in the future. I like the fact that it's lightweight and doesn't break me out. If you have an oily skin type, I think this foundation is good for you because it has a pretty good oil controlling property. I also asked my friend to try this foundation on her skin, which she has an oily skin type just like me and the result was more less like mine. All in all, it's a good product and I'm enjoying it! Have you ever tried this foundation? What's your favorite foundation of all time? 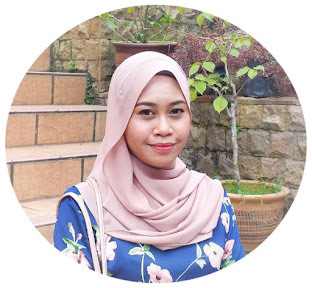 I am searching for Best Dermarollers For Acne Scars, but your post gave idea of foundation make up to hide acne scars. Thank you for informative post.